If you import and transport goods to the UK in 20ft or 40ft containers, you will looking for somewhere that has the facilities to remove them. In most cases, when your supplier loads your container for onward shipment they will simply stack the cartons containing your products into the container. 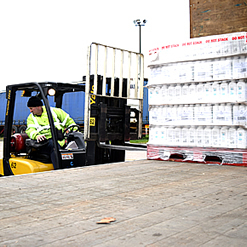 On arrival at our site we then have the facility to remove the cartons and palletise them for storage in our warehouse or for onward distribution. At PC Howard Limited, accepting goods in this way poses no problems to us at all - we have dedicated loading docks, and an experienced workforce who will utilise our facilities to ensure that your goods are safely stored away and then made available for quick dispatch. This process is known as 'container de-stuffing'. Whilst the process is relatively straightforward, this is only the case if the logistics company concerned has the assets and capabilities to be able to handle containerised goods in this way. As a leading third party logistics provider, PC Howard utilises the companies infrastructure to effectively manage containerised freight and re-destribute it either via our own dedicated vehicle fleet or the palletways network. We make the management of containerised freight simple and effective.